It’s official. 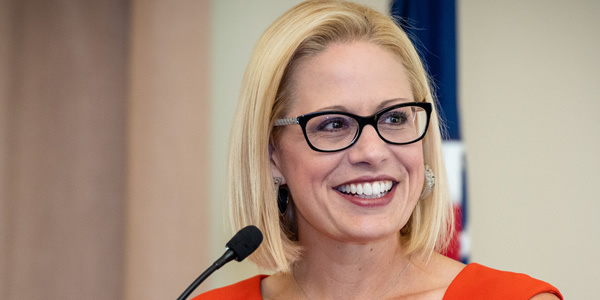 Rep. Kyrsten Sinema, an out centrist bisexual Democrat, has defeated Donald Trump’s choice to replace retiring Arizona Sen. Jeff Flake, Republican Rep. Martha McSally. It’s the first Democratic win in the red state since 1976. Sinema, 42, posted a statement on Facebook pledging to continue working to “find common ground.” “That’s the same approach I’ll take to representing our great state in the Senate, where I’ll be an independent voice for all Arizonans,” she wrote. Democrats now control at least 47 Senate seats, though Republicans still hold the majority with 51—with two seats still undecided, Florida, where there is a recount, though Rick Scott is sure he beat Democratic Sen. Bill Nelson, and in Mississippi, where there is a runoff. Sinema joins out Wisconsin Sen. Tammy Baldwin, who faced a hard fight but handily won re-election in the end. Sinema talked to the Los Angeles Blade before her appearance at the Human Rights Campaign gala last March. She expressed then much of the same attitude as she expressed during the campaign and with her victory. “Growing up, we were like every other working family until my dad lost his job and we lost our home. We ended up living in an abandoned gas station for nearly three years. But I worked hard, got an education, and got my shot at the American dream. I’m focused on making sure every Arizonan gets his or her shot just like I did,” Sinema told the Los Angeles Blade. Sinema said being an out bisexual for her three terms in Congress has not been an issue. “When I talk with Arizonans, it’s the last thing on their minds. Arizonans want to talk about protecting our health care and jobs,” she said. It may be this desire to solve problems that explains her strategic political evolution.